Think of it as an early version of the Kindle, except from a time when Amazon was still just the name of a river. This "pocket reading machine" was invented by Admiral Bradley Fiske in the early 1920s and sought to squeeze an entire novel into a tiny device. At just over 6 inches long and 2 inches wide, the proto-Kindle could hold cards with over 100,000 words — enough, apparently, for the entirety of War of the Worlds by H.G. Wells. Storing multiple novels in a compact space was truly the wave of the future! 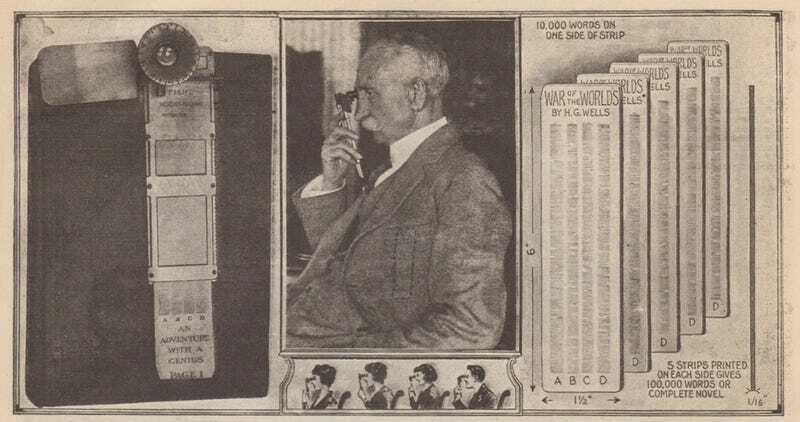 The June 1922 issue of Science and Invention magazine included photos of the newfangled contraption, complete with Fiske staring into his futuristic reading machine. Despite the accompanying article's insistence that there was no great strain on the eyes, it would appear that the photos themselves refute this assertion. Holding that thing up to your eye for as long as it would take to read a novel couldn't have been comfortable. Fiske had a distinguished career in the U.S. Navy at the turn of the 20th century, where he helped conceive of innovations like radio systems to help control torpedoes and an electric range finder. So it only seems natural that when Fiske retired in 1916 at the age of 62, he didn't just sit around on his laurels. He continued making stuff, like his little machine that could hold a complete novel on just a few strips of paper, however impractical it may have been. Perhaps the most antiquated thing about this device is the idea that anyone would read 100,000 words of anything. In fact, this humble blog post is just 315 words and you've no doubt already stopped reading. Just kidding. I knew you'd make it to the end. Good work, team!